From yard hydrants to installing irrigation lines and cattle watering systems, we know how to take care of the irrigation needs of our customers. 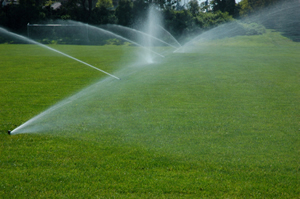 Our irrigation experts are experienced in a variety of watering system installations and repairs including yard hydrants, irrigation lines, sprinkler system, lawn watering systems, cattle watering and more. Irrigation is a convenient way to bring water to different parts of a lawn, yard or farm field. Our irrigation systems come in a variety of styles and sizes that can be installed to fit most environments, making it an easy investment for watering your gardens or other landscape areas that require irrigation. Call our irrigation experts today to learn more about the watering systems was can install, repair and maintain. With the wide variety of expertise our plumbers can ensure that the irrigation installation needs of our customers are met. You can count on us, your reliable plumber, for all your irrigation needs. Call us today to discuss your irrigation and watering system needs.